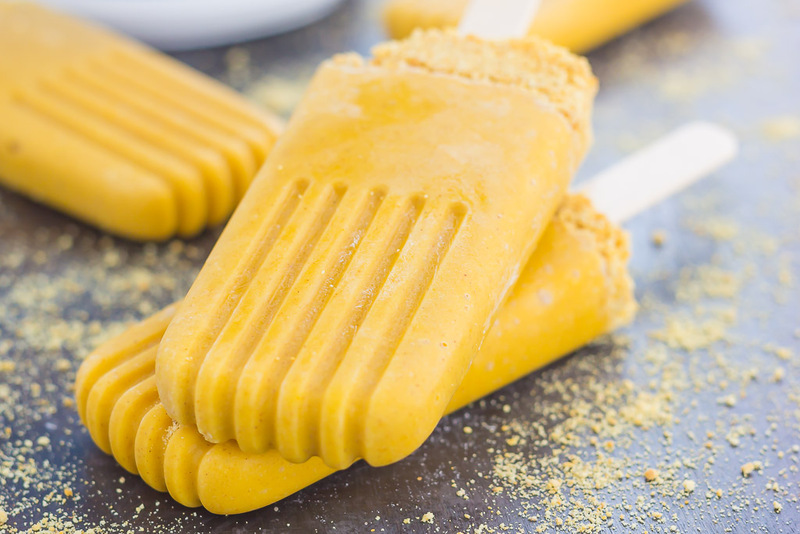 These Pumpkin Pie Pops taste just like the classic pie, but in frozen form. 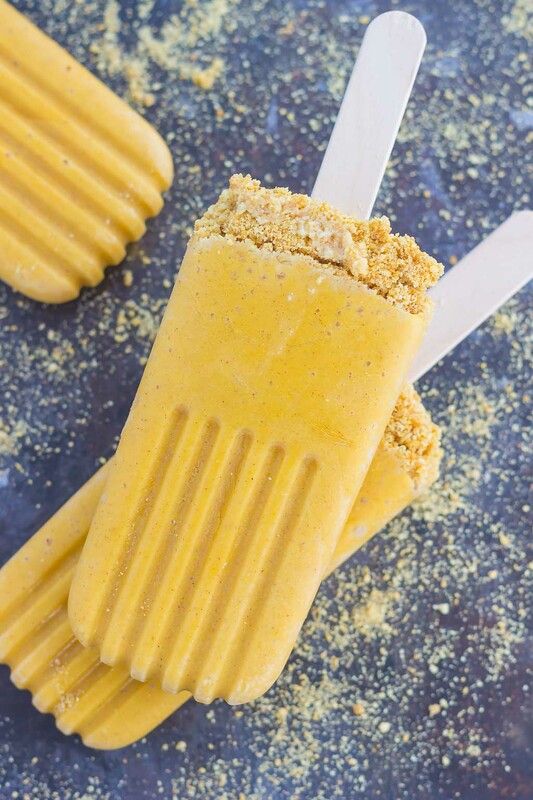 Sprinkled with a graham cracker crust and filled with healthier ingredients, these creamy pops are the perfect dessert for the season! If you’ve been hanging around here long enough, you know that I alway start my day with a cup of coffee. And if you follow along on my Insta-stories, you get to see my ‘flavor of the day’ and fun creamers that I add to my coffee, too. Another thing you’ve probably noticed on my Insta-stories is that I always add a scoop (or two) of Vital Proteins® Collagen Peptides to my coffee. I do this every morning, and have so for the last eight months or so. It’s an unflavored protein powder that is extremely beneficial to the body. It helps to improve your hair, skin, nails, joints, ligaments, and tendons. Ever since I’ve started using Vital Proteins® on a regular basis, I have noticed improvements in my overall health, especially to my hair and skin. If you haven’t heard of Vital Proteins® before, you’re in for a real treat. I am so excited to be partnering with them because it’s a product that I truly believe in and use every day. Vital Proteins® Collagen Peptides help people feel better and live better lives, too. Vital Proteins® provides a way to help your body boost collagen in a natural and safe way. By using collagen daily, it can help to provide glowing skin, joint health, healthy cartilage, improved digestion, and even a deeper sleep, among other benefits. And Vital Proteins® has many products to help with with that! 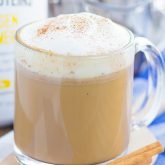 Most of their formulas are orderless and tasteless (like the Vital Proteins® Collagen Peptides that I add to my coffee every morning) and instantly dissolves in liquids. 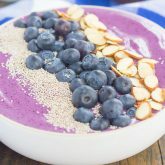 It can be mixed into beverages, smoothies, baked goods, savory dishes, and more. It’s so easy to incorporate this into your diet. With different collagen products, collagen creamer, beauty waters (my favorite is the lavender lemon), bone broths, collagen and whey protein, green and veggies, and other supplements, there’s bound to be a product that is perfect for you. Want to learn more? Head over to this site and check it out! Ok, now let’s get to the real reason why you’re here today…pumpkin! What are your feelings on pumpkin pie? The classic kind? Love it? Like it? Take it or leave it? Or no way? I do love pumpkin, but pumpkin pie and I have a more complicated relationship. I love a slice (or two) around the holidays, but then that’s it. I really can’t have too much pumpkin pie, otherwise it kinda makes me feel sick, if that makes sense. Kinda like egg nog and white chocolate, too. I love them both, but can only have it in small doses. So I guess you can see where this is headed, right? I’ve got the most delicious pumpkin pie-ish treat for you today, friends! 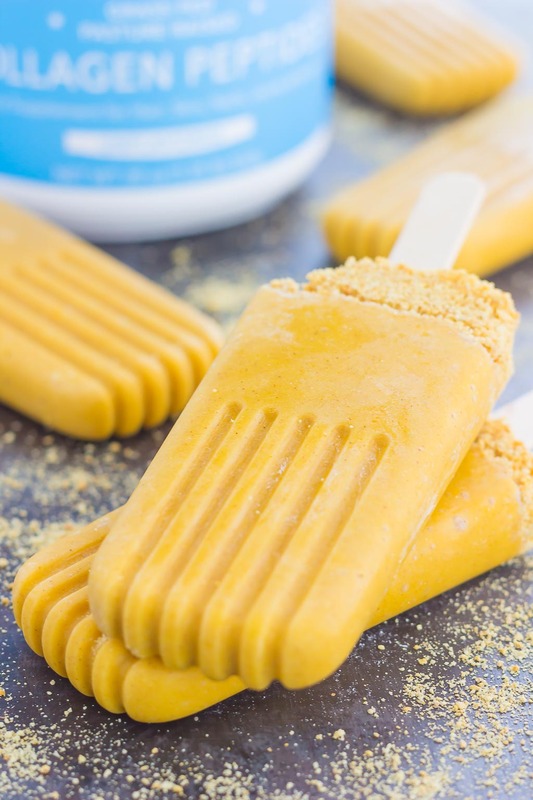 These Pumpkin Pie Pops taste just like the classic pie, but in frozen form. 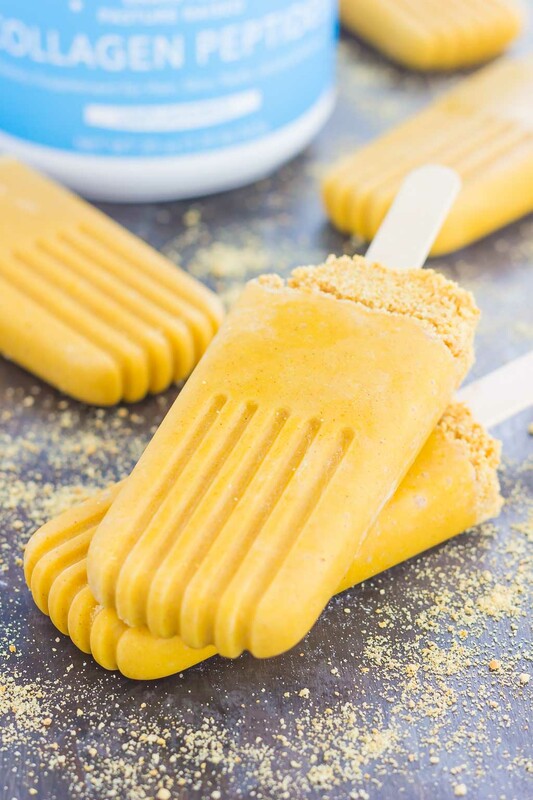 Sprinkled with a graham cracker crust and filled with healthier ingredients, these creamy pops are the perfect dessert for the season! And let me tell you, these Pumpkin Pie Pops are so good, friends! And I’m not just saying that because I made them. The base of these pops are pretty simple. And actually, you could easily turn this into a smoothie (and forgo the popsicle mold). 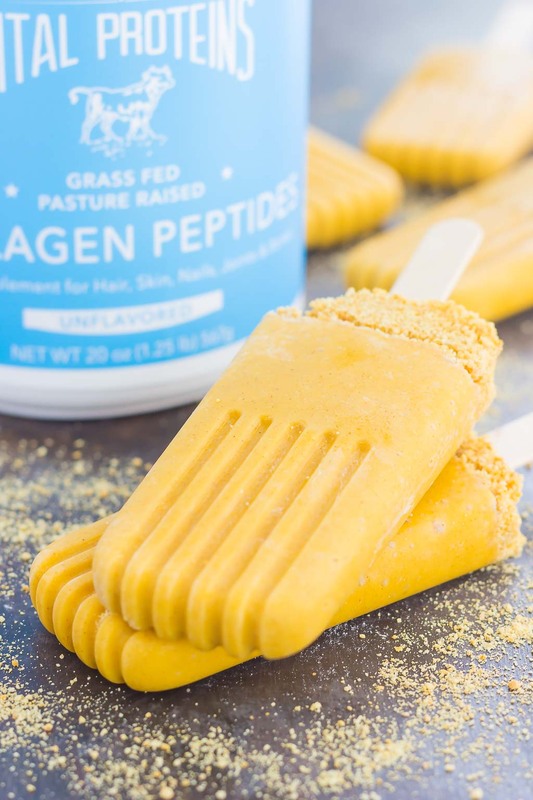 Vanilla Greek yogurt, some milk, pumpkin, pumpkin pie spice, and a few scoops of Vital Proteins® Collagen Peptides makes these pops extra delicious and extra creamy, with added health benefits, too. It really tastes like you’re eating pumpkin pie on a stick! But, trust me, the flavor isn’t too overpowering. I had the hubster (who detests pumpkin pie) try these and he gave it the sign of approval. And that means it’s extra good! And like most of my recipes, these Pumpkin Pie Pops couldn’t get any easier to make. Simply toss the ingredients into a blender and then pour it into some popsicle molds and wait for them to freeze. Easy peasy and oh-so good! So if you’re looking for that unique spin on your next pumpkin treat, look no further. I guarantee you’ll love these quick and easy Pumpkin Pie Pops! 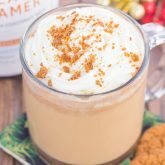 In the canister of a blender, add the yogurt, milk, banana, pumpkin, Vital Proteins® Collagen Peptides, pumpkin pie spice, cinnamon, and honey. Blend until smooth. Pour mixture into 8-10 pop molds, leaving about a 1/2 inch of space at the top for the graham cracker crust. Set aside. In a small bowl, stir the graham cracker crumbs and melted butter together until combined and crumbly. Spoon onto the tops of each popsicle mold. Insert popsicle stick into each mold and place into freezer. Freeze for at least 3 hours, or until hardened. I love pumpkin ice cream so I know I'll love these! Such a clever idea! It's definitely a great alternative to pumpkin pie! These pops sound incredible! I love the idea of eating "pie on a stick," and I bet my kiddos would too! So fun, and so perfect for the season! Thanks, Blair! Pie on a stick is so fun! These popsicles look amazing! Love the flavor and the crust! I've never tried Vital Proteins®, but will definitely do! Thank you, Mira! It's a fun alternative to pie, especially with the addition of Vital Proteins! I've definitely seen your IG stories, Gayle, and I love seeing your coffee flavor of the day! You have some fun flavors! Speaking of fun - these pops!! Love this spin on pie and the "crust" addition is brilliant! 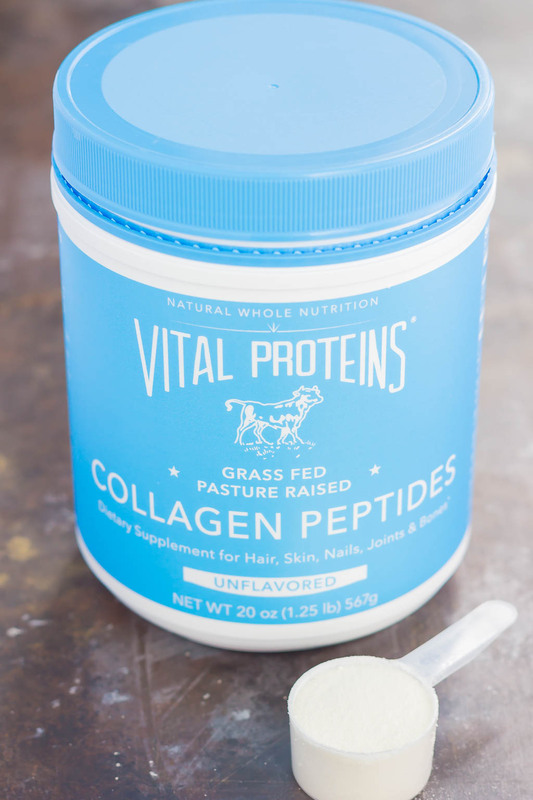 I've never heard of Vital Proteins Collagen Peptides, but I'll have to check them out! Pinned! Cheers! Thanks for the sweet comment, Cheyanne! I've seen Vital Proteins around but have never tried them. This post has intrigued me to really give them a try! 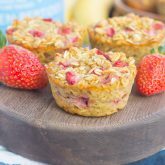 I love the idea to add them to my coffee, smoothie, or what have you. And definitely these pops! These look so creamy and full of pumpkin flavor! Thanks, Marcie! I think you would love Vital Proteins! I love pumpkin in any form so I am loving these pops! Pumpkin pie is delicious in pop form! Yay for pumpkin. It's not something that I grew up eating, but absolutely love it now and these pops are absolutely genius! Love that crust! Pinned! Have a wonderful weekend, Gayle! Thank you, Dawn! Happy weekend to you too!